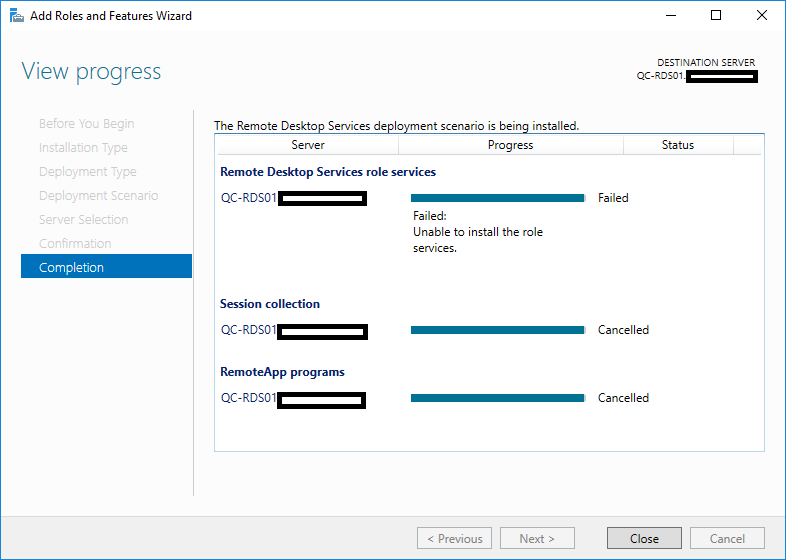 RDS on Server 2016, Failed: Unable to install the role services. In putting together a small RDS (Session Based) environment on Server 2016 today today I kept running across the error message below during the installation. Failed: Unable to install the role services. After much back and forth between forums and event viewer it turns out our default policy to disable TLS 1.0 on servers was the issue. Enabling TLS 1.0 (through the registry or with the fantastic IIS Crypto – https://www.nartac.com/Products/IISCrypto) ended up sorting the issue for us. After a fair few months of work and with support from the team at PACKT my new book (Microsoft Application Virtualization Cookbook) is out on sale. 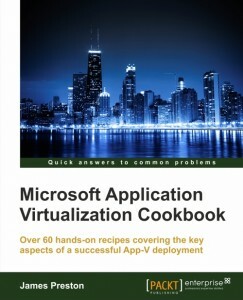 The book is available in both Print and eBook form and can be ordered from PACKT publishing at this link – https://www.packtpub.com/virtualization-and-cloud/microsoft-application-virtualization-cookbook. Custom RemoteFX RDS Farm – Stress test 2 – How many users per server? Its looking like we got our sizing for our custom RDS servers right and we may well have answered (at least for own internal use) ‘how many users can you get on a RDS server?’. The video shows our RDS farm under normal load with 24 clients remotely logged in (excluding the admin session I was using) with the CPU usage being either low or idle on occasion. While waiting for the cases/power supplies to arrive for our RDS Server Farm I thought we might as well fire one up and do a little stress testing, the first results (which look at application load times) can be seen below. Here you see pretty much the entire Office 2007 and Adobe CS6 suite (with a few other programs thrown in for fun) load in almost no time at all. In the background we had 6 students playing videos on YouTube (RemoteFX doing its thing) however this realy is just a test of the OCZ Vertex 4 SSD. Sometimes you will want to connect to a particular server in a RDS load balanced farm (maybe you want to perform a particular update on that server or something similar) however when you RDP onto it the load balancer kicks in and you may not get the server you were after. The simple solution is to start a remote desktop session to that server using the /admin switch. The screen shots below show one of many methods you could use to start the session.